Bonjour et bienvenue to the fifth issue of La Marmite! New Year's Eve in France Menu. An elaborate menu to tickle your taste buds and two unusual recipes to get you started. French hangover cures for the next day. 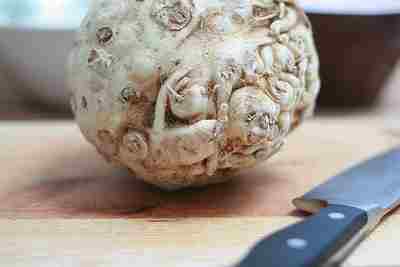 Vegetable of the month: Celery root. Take a survey and help me better serve you. 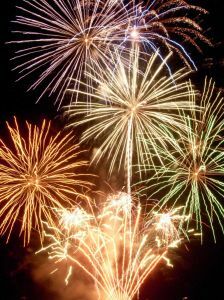 In France, just like many places in the world, the New Year is rung in with considerable fanfare and merry making. However, in France you will find that there is more emphasis placed on the meal that is eaten then in many other places in the world. Lots of people will eat out in a restaurant, where they will be served an elaborate, many coursed meal. The restaurant will provide entertainment and music and perhaps a place to dance. Towards midnight, silly hats and confetti will be distributed and everyone counts down to the New Year together. After that there is considerable commotion as everyone in the room exchanges hand shakes or kisses and wishes each other a Bonne Année. To give you an idea of how grandiose these meals can be, here is the menu as it is being served at the elegant Bristol Hotel in Paris this year. Of course, not everyone goes out to eat an eight course meal on New Year's Eve in France. Some ambitious home cooks go through incredible efforts (many with a good deal of panic and angst) to produce an elaborate meal for their friends and family. I'm not suggesting you do this, but I thought you might like to try a couple of recipes that are popular at these meals. Foie gras is an incredibly popular party food in France. For many French people, they could not consider having a holiday celebration without including foie gras somewhere on the menu. Foie gras is very rich and thick on the tongue, so it is quite nice to contrast it with something lightweight and fruity, as in this salad. If you wish, you can learn more about foie gras here. Steam cook the green beans until just tender, then rinse in cold water so they stay green. In a pan on medium heat, toast the filberts just until golden. Sprinkle the mushrooms with the lemon juice. Prepare a vinaigrette with the salad oil, vinegar, mustard and salt and pepper. Arrange the mesclun on four salad plates and attractively place the green beans, mushrooms, and mango slices on top. Pour the vinaigrette evenly over the salads then top with the foie gras and sprinkle with the toasted nuts. Trou normande literally means a Normandy hole. What a name, and what a concept! It's a hefty shot of alcohol served in the middle of a meal, perhaps after the first substantial course, and said to clear the palate and expand the belly in preparation for the excess that is about to arrive. Chew on a few coffee beans and then swallow them. Right afterwards, drink a large glass of cold water. Mix together a teaspoon of baking soda, the juice of half a lemon, one aspirin, and a glass of cold water. To soothe a burning stomach and help digest, drink wild thyme tea. For a tea to help eliminate gas, steep a couple of ounces of fresh rosemary in a liter of hot water. (And don't forget to drink lots of water before, during, and after a celebration). I am a terrific fan of vegetables and if you're not, I'd like to help you become one too. That's why every month I'm planning on promoting a vegetable, perhaps one that is a little unusual and you are hesitating to try. Celery root, this month's star, is ugly enough to give one pause. Here in France we can only buy this knobby root au natural, but you may find it in your grocery store, cleaned and peeled, ready to cook. Whichever way you find it, celery root is very easy to fix and absolutely delicious. It's in season during the winter months, so take advantage of it now. This wonderful celery root puree recipe would be perfect with your Christmas dinner or any other time you are thinking of serving mashed potatoes. If you have just a minute extra and would like to help me bring you more of the information you are looking for, fill out this quick and easy survey. What would you like to see more of at Easy French Food and in La Marmite? Have you ever tried one of the recipes on Easy French Food? If yes, which one? How would you rate it (one to five stars)? Would you buy French food products by mail order? Would you buy French cookware by mail order? Thanks so much for spending some time with me. In the next issue, due out on January 15th, you can learn all about crepes, just in time for la fête de Chandeleur.